Chaco Chachalaca is mainly vegetarian. Relatively abundant within its range, this species is medium-sized with dull plumage. Adult male has brownish-grey upperparts, with browner mantle. Wings and tail are grey, with browner wing coverts and darker grey flight feathers. Uppertail feathers are dark grey with rufous-tipped external feathers. On the underparts, throat and breast are grey. Belly is pale rufous. Flanks, vent and undertail coverts are chestnut, as the rectrices. Head is grey with small area of reddish bare skin on lores and around the eyes. Chin shows red bare dewlap, more or less conspicuous according to the season. The strong bill is typical of Galliformes with down-curved form and hooked tip. Bill is whitish to horn-coloured. Eyes are dark brown surrounded by narrow, pinkish eye-ring. Legs are strong and fairly long. The feet show an elongated hind toe at the same level as the three front toes. Legs and feet are pale grey or pale pink. Both sexes are similar, but female has smaller and duller dewlap, and she is slightly smaller than male. Juvenile resembles adults with duller and softer plumage. O.c. canicollis, from E Bolivia, W Paraguay and N Argentina. O.c. pantanalensis, from SW Mato Grosso, Brazil. This one is browner, less greyish and larger in size. 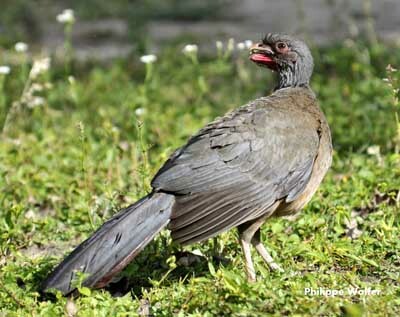 Chaco Chachalaca as other Cracidae is highly vocal. It utters loud cries, often in duet with its mate, or in groups. At this moment, we can hear a strident chorus gathering pairs’ duets and individual voices. 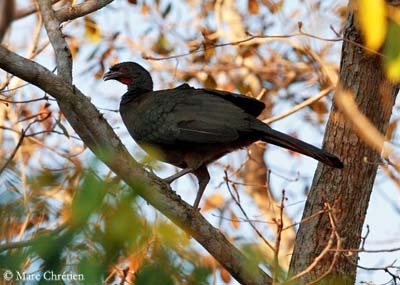 The “Chachalaca chorus” can last more than two hours, usually in the early morning. 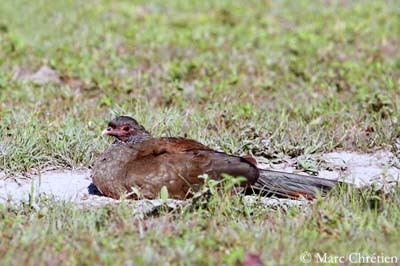 The name “chachalaca” comes from the calls of this species. They also give squawks and whistles, used as contact calls when feeding, or alarm calls. Chaco Chachalaca frequents swampy lowland forests and close scrubs, borders of trails and groves’ edges with close vegetation for cover. The race “pantanalensis” is found in gallery forests, semi-deciduous forests, palm groves and secondary forests. Chaco Chachalaca is probably sedentary in its range, from E Bolivia, W Paraguay and N Argentina, and SW Mato Grosso, Brazil. 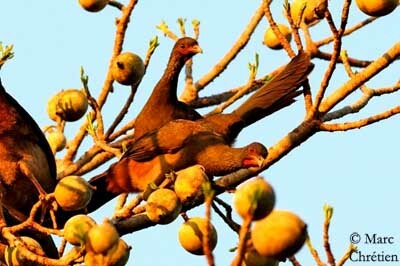 Chaco Chachalaca feeds mainly on plant matter such as fruits, seeds and flowers. It also takes caterpillars which can be very abundant in certain years. This species is a good disperser because the fruit seeds are defecated intact. 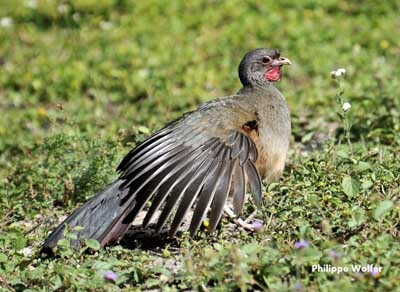 Chaco Chachalaca usually forages in groups of up to 30 birds. They feed at top and crown of the trees, but they come sometimes to the ground or close if the undergrowth is not too thick. They take the food items with the bill from trees, shrubs and vegetation, or from the ground for fallen fruits, seeds and some invertebrates. 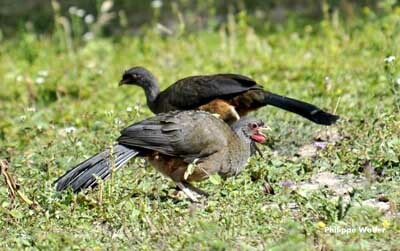 Chaco Chachalaca is territorial and both mates defend the territory against predators. They can be very aggressive and fights may occur. They probably are monogamous and form strong pair bonds. The courtship displays of this species seem to be simple, with strutting and calling with head erect, in order to expose the red dewlap. They also perform mutual preening, chases and courtship feeding. Copulation often occurs in tree tops or on the ground. Chaco Chachalaca as other Cracidae is a poor flier. However, after active wing-beats, it is able to make long glides, and the long tail is used as support. They can perform a quick escape if necessary. Breeding season occurs between November and February in N Argentina, during the rainy season. The nest is a shallow platform. It is a loose, small structure made with sticks, stems and leaves, without any lining. The nest is often situated between 2, 5 and 4 metres above the ground. Female lays 3-4 eggs. Incubation is by female alone, while the male remains in the vicinity for protection. Incubation lasts about 24 days. The chicks are highly precocial and are able to leave the nest very soon after hatching. At this moment, they can grasp branches and climb through the vegetation, and even flutter for short distances. Both parents feed them, often by regurgitation but also by offering food items in the bill tip. They become independent very soon. 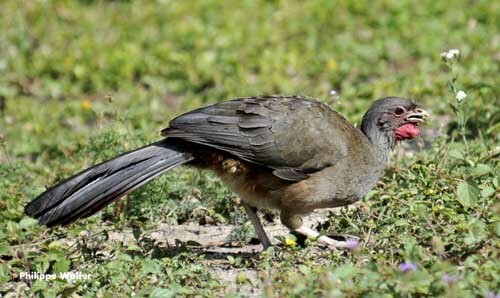 Chaco Chachalaca is vegetarian, feeding on fruits, seeds and flowers. It also consumes some invertebrates and caterpillars. 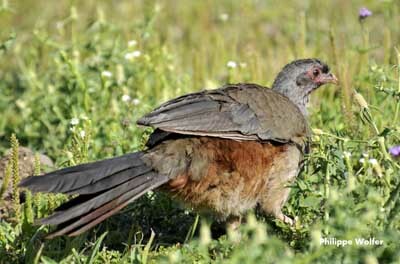 Chaco Chachalaca is common in its range, or locally abundant. The habitat is degraded by overgrazing, deforestation and fires, giving restricted suitable areas in several parts of the range. They also are persecuted by hunters for food and sport. However, this species has fairly stable population, and it is not threatened at this moment.